Thursdays from 9:00 AM to 9:00 PM in the Chapel. Jesus Christ is always present and active in His Church: in the celebration of the Sacred Liturgy, the teaching of the faith, the apostolic work of the Church’s ministers and people – indeed in the whole life of the Church, which is His Mystical body. The Second Vatican Council, suggests the four ways in which Jesus is present in the Liturgy: (1) in the person of the priest, who stands in the person of Christ, the Head of the Body, the Church; (2) in the assembly of Christ’s faithful gathered to worship God; (3) in the Word of God proclaimed; and (4) especially in his Body and Blood, under the form of bread and wine, in the Eucharist. There is an intimate connection between Mass and Eucharistic Adoration. Adoration prolongs and meditates upon the fourth and unique way of Jesus’ presence. Jesus, who becomes present with us at Mass, remains with us and shares Himself with us when we come to adore Him. It can be used as a time to further ponder the mystery of the Eucharist we have received in Mass and as a preparation in prayer for the next time we receive. During Eucharistic Adoration, the Blessed Sacrament (a Host consecrated at Mass) is displayed in a special vessel called a monstrance (from the Latin verb monstrare, “to show”). The monstrance is placed on the Altar for the adoration of the faithful, who come to pray and to spend time resting in the Lord’s presence. Please consider coming to pray and spend time with Our Lord, present in the Blessed Sacrament. Eucharistic Adoration at Saint Michael Church is held every Thursday from 9:00 am to 9:00 pm, in the Daily Mass Chapel, unless otherwise announced. When a priest is available, Benediction is celebrated at 8:45 pm.The ritual of Benediction includes a hymn, a verse and prayer, a blessing with the Eucharist in the monstrance, and the Divine Praises, a special prayer of praise to God and of honor to Mary and the Saints. 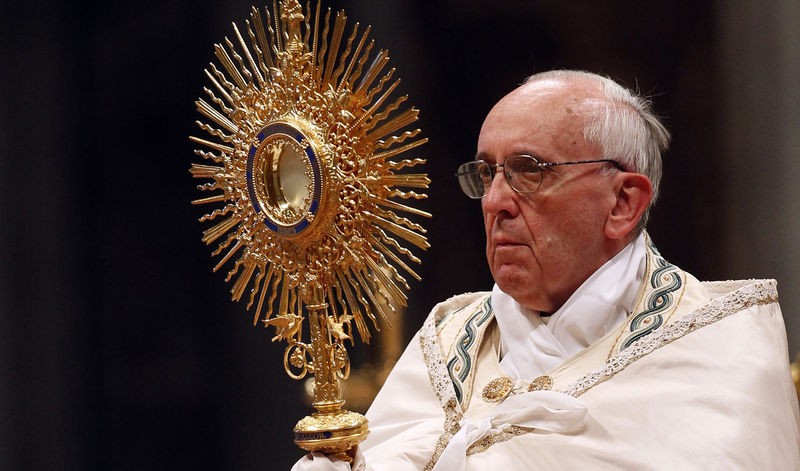 The priest holds the monstrance with a special vestment called a humeral veil.